$260 million Waseca division of publicly traded company melds 550 employees into a working team. So really, what do they manufacture in that building by the water tower? The answer is a bit complicated, but it all starts with the six million or so two-way radio modules the Waseca division annually manufactures for investor-owned, municipal and cooperative utilities. These radio modules are mounted on existing residential and business water and gas meters (modules for electric meters are made in South Carolina) and when prompted via a radio signal they transmit consumption information and other data to utility employees on the perimeter of a home or business. The employee can be walking a route or driving in a vehicle at normal traffic speeds. In this way utility employees never have to enter any homes, and through this efficiency city utilities and energy companies need fewer employees. The modules can send their information either automatically through timed, periodic bursts, or en masse when prompted by a radio signal. The information received includes the radio module serial number, consumption information, and sensor feedback that might suggest tampering. In southern Minnesota, besides Waseca, Itron product is used on utility meters in Owatonna, Albert Lea, and Northfield. Company-wide and internationally, Itron offers utilities what it calls “complete solutions,” meaning not only does it manufacture and market radio modules—such as those made in Waseca—but it can also provide a utility with a full suite of products to enable them to automate their data collection and billing systems, installation services, forecasting software, and “hosted” packages. The latter means Itron can furnish just about everything, from buying the meters, installing modules on the meters and running the complete system, to providing billing information. The company also can build a larger, fixed network system—such as the $45 million one it sold to Duquesne Power and Light of Pittsburgh that can read 465,000 meters daily. An Itron radio module system lasts about twenty years, so cities and utilities achieving paybacks of seven to ten years, which are about average, in essence receive more than ten years of free service before a new system must be installed. The company currently maintains a 79 percent share and the top position in the U.S. gas meter module market, having installed more than 22 million since bringing that product forward in 1986. It has a 50 percent share and also the top position in electric meter modules, and a 31 percent share in water meter modules. The future looks bright as can be: In the U.S., total market penetration in the industry is less than 25 percent, and internationally, less than 5 percent. There is plenty of room to grow. The automated meter reading industry, and therefore Itron, easily could triple or quadruple in size over the next ten years as local governments—and publicly traded utilities—seek to become more efficient. The current company culture in Waseca had its genesis in a 1990 internal makeover edict from then-owners EF Johnson. The company was actively searching for buyers for its three divisions: Johnson Components, Johnson Radio, and the Automated Meter Reading division (which became Itron in Waseca). EF Johnson wanted them lean, mean and more profitable. Before this massive change took effect, consultants said to expect that up to 15 percent of employees would leave out of frustration. Overall, the restructuring went well, without too many hitches. Line employees took on more responsibilities, began offering their suggestions to management, acquired the power to shut down lines when something went wrong, and began feeling a sense of ownership. Most importantly, an improved bottom line attracted the attention of a potential suitor, Itron, of Spokane, Washington. Itron had been working on a product competing with EF Johnson’s radio module. It already was making and selling a hand-held computer for meter readers, a quantum-leap improvement over the old system of manually writing down meter readings onto paper. After purchasing the division from EF Johnson in 1992, Itron stopped the duplicate efforts and focused on expanding their market to include electric and water utilities. Waseca would become the main manufacturing hub for meter modules, and selling meter reading systems to utilities would become the sole company focus. In 1992, this new division of Itron had 80 employees and was leasing 25,000 sq. ft. of manufacturing space in the EF Johnson building in south Waseca. With aggressive support from the City of Waseca and local businessmen, the company in 1994 leased and moved into a new 48,000 sq. ft. facility on the north side of town. “Back then I was a manufacturing engineering manager,” said Whitney. “We projected that building would last at least five years. Only two years later we had to ask the board of directors (of Itron) if we could expand the building by another 22,000 sq. ft. We expanded again by 38,500 sq. ft. in 2004.” Despite hiccups, and some overly optimistic growth forecasts in 1997, the company still was growing far beyond initial expectations. All through it, Itron corporate resisted tinkering with the division’s flat organizational structure and self-empowered company culture because everything was going so well. 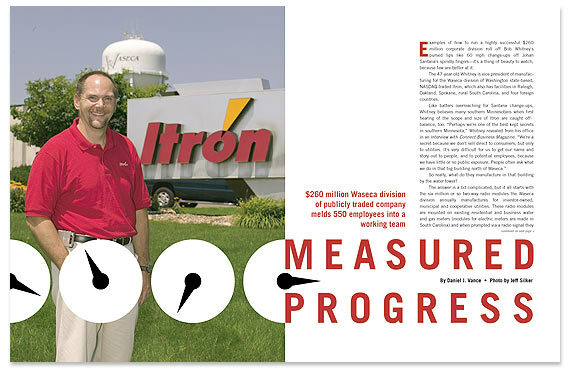 In 2004, Itron grew more, purchasing a South Carolina manufacturer of electric meters and modules. The company culture that developed was truly unique. Production people began receiving annual pay reviews based primarily (75 percent worth) on how the entire team performed. The rest of the review, only 25 percent, was based on individual performance. Suddenly, a financial incentive existed for everyone to work well together. Team members earned more pay by taking on additional production line duties—ones formally performed by lower-level management. A number of production teams began face-to-face roundtable discussions to improve performance, providing pertinent feedback to each team member at the time of their performance evaluation. A North Dakota State University master’s graduate in Industrial Engineering, Whitney seemed well prepared in more ways than one for his April 2000 promotion to the top executive spot in Waseca. For example, when growing up, he had helped run the Twist Top restaurant in Grand Rapids for seven years, from ages 12 through 18. The Twist Top was a budding business executive’s dream realized. Whitney’s mother and father decided in 1971 to invest in a Dairy Queen-like restaurant to help their ten children learn more about business and earn summer money. In other words, they provided all their children with a “paid internship” into the business world. The Twist Top opened in late spring and closed the end of summers. The oldest child was the first manager, and when that child graduated from high school the next oldest would take over. Whitney had his turn in 1977. The manager was put in charge of putting together work schedules, making payroll and bank deposits, handling work squabbles, buying supplies, balancing the books, advertising, and recruiting non-family employees. After nearly everyone in the family had graduated, Whitney’s father converted the Twist Top into a gas station, which still exists to this day. “I certainly learned a lot about business,” said Whitney, in what was probably a major understatement. From there, he went off to North Dakota State in Fargo, graduating in 1983 with a master’s degree. EF Johnson of Waseca, Minn., recruited him—they also had offered him a job two years earlier after his bachelor’s degree. Waseca, as a city, met his criteria of wanting to be near several of his brothers and sisters in Minneapolis, and the company itself, “seemed like a good place to get a couple of years experience and move on,” he added. EF Johnson hired him to join an international team that was trying to develop a hand-held cellular telephone—not unlike other early cellular telephones ultimately brought to market by Motorola and Nokia. The team included engineers from a British company. The work was trend setting and leveraged prior work of developing a cellular car phone, but EF Johnson in time decided to reallocate its dollars to concentrate on profitable ventures, such as land mobile radios and CBs. At that time in Waseca the company was also working alongside GTE to develop the AirFone system, which was similar to the systems used today by major airlines as an on-flight telephone system for travelers. “Of course, this was all before the cellular market really developed,” said Whitney of the mid-80s. “So when cellular suddenly took off, we couldn’t catch up. We were ahead of our time—we just didn’t know how far ahead.” The hand-held cellular telephone EF Johnson was developing was about the size of a brick. Remarkably, the flat-as-a-pancake organizational structure of the division Whitney inherited in April 2000 resembled that of his family’s organizational structure in the ‘60s and ‘70s. So it seemed a natural for him to perpetuate the company culture—the same kind of team-focused, self-empowered culture that had played a considerable role in his division’s success, and in his own personal success. For instance, on the west wall of Itron’s 100,000-plus sq. ft. facility is a bulletin board displaying the photo IDs of current line employees. The board notes various employee job responsibilities. Finally, Whitney said he tries hard to shield his Waseca employees from the quarter-by-quarter expectations of corporate headquarters in Spokane, and from the constant pressure Itron feels from investors and Wall Street. After all, it’s a publicly traded company, and you’re going to feel that pressure. Whitney believes that employees already put enough pressure on themselves and don’t need more prodding. They know perfectly well that every penny saved building a meter module can free up tens of thousands of dollars for the company profit sharing plan, he said—and tens of thousands is no exaggeration, considering the company manufactures up to six million meter modules a year. Many of the division employees, on their own, eye their bottom line each quarter as budget hawks, as if the company was theirs, as if it were their Twist Top. The unique characteristic of our facility in Waseca centers around the work ethic of our employees. We have 550 employees and draw them from a 35-mile radius. People coming here want to work and make the company better. They’re interested in how things work—they have a curiosity that helps us make our product and systems better. This division is not one built by Bob Whitney. It’s one built by its employees. It’s very hard to find a work ethic better than that in the Upper Midwest. —Bob Whitney, Itron vice president of manufacturing. Waseca has a diverse population. Some migrant Hispanic workers coming to Waseca have chosen to stay and work full-time at Itron. We also have a number of Somali employees and have chosen to accommodate their religious practices. We have worked to allow as much of their traditional clothing as possible, without negatively impacting safety or product quality. When they have their prayer times, such as during Ramadan, we allow them to take their normal breaks in conference rooms or other areas. We try to accommodate as many belief systems as possible, not discriminating against anyone. —Bob Whitney, vice president, who modestly displays symbols of Christian faith in his own office. Bob Whitney, Itron vice president of manufacturing, said that many employees are hired due to word of mouth advertising by other employees—even more so with his engineers from Minnesota State. Itron and Minnesota State have a good working relationship. Each year a number of MSU students majoring in electrical engineering, manufacturing engineering technology, and electrical engineering technology, spend the summer at Itron as interns—this year it was seven. Whitney claimed that historically about half of them stay on full-time, and over the years this has resulted in “dozens” of MSU students being hired. Typical starting wage for a “fresh-out” MSU engineering student is north of $45,000, Whitney said. Itron has a number of competitors, both domestic and international, said Bob Whitney. Companies in countries such as India, Pakistan, China and South Korea certainly have advantages in being able to offer lower labor costs. Itron has been able to counter those lower wage rates by keeping to a minimum the amount of labor going into its product, and exercising its substantial purchasing power. He said his division regularly bids out its product to contract manufacturers as a “sanity check” to see if the product could be built for less. That said, the company—from a job security and quality assurance standpoint—would prefer continuing to drive costs down and improve efficiencies rather than outsourcing.